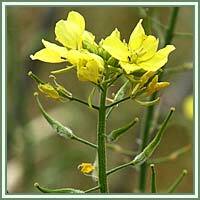 Habitat: White mustard is native to the Mediterranean region. It grows on fields and waste areas, on calcareous soils. 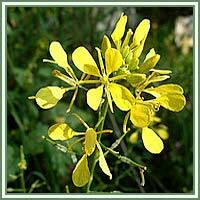 Description: White mustard is an annual plant, with an erect stem and numerous branches springing from the main stem. Leaves are alternately arranged, petiolate and serrated, with short, white bristles along the veins. Flowers are pale yellow, forming a shape of a cross. Flowering occurs from June to August. Seeds are globular, dark reddish-brown. Medicinal use: White mustard seeds are considered to be analgesic, carminative, expectorant and stimulant. Traditionally, they have been applied in cases of digestive complaints. An infusion of the seeds is useful in treatment of chronic bronchitis, rheumatism, muscular and skeletal pains (it stimulates circulation in the pain area). Externally it is usually made into mustard plasters, poultices or added to the bath water. It can also be used for skin eruptions. Mustard tea is used for fevers and colds. Safety: The seed contains substances that can irritate the skin and mucous membranes. It is advisable to consult your doctor or herbalist before consumption of White mustard.